The Congress is trying to save Christian Michel, the alleged middleman in the AgustaWestland chopper deal, the BJP alleged a day after a youth Congress leader represented him in court. 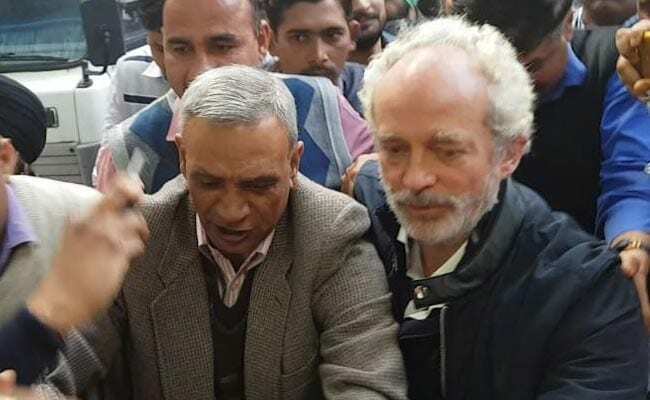 Claiming that all three lawyers representing Michel were from the Congress, the BJP said a "full surveillance" has been launched on him by Congress chief Rahul Gandhi and his mother Sonia Gandhi. Yesterday, the Congress said Aljo K Joseph, the national in-charge for the legal department of the party's youth wing, has been expelled for failing to consult senior leaders before taking the case. The party said it has asked all its members not to take up the Mitchell's case. The BJP -- which has been accused of crony capitalism by the Congress in a Rafale deal - however, indicated that the expulsion was an eyewash. Tying Michel's British nationality to the foreign origins of Sonia Gandhi, BJP spokesperson Sambit Patra taunted, "In his letter to Finmeccanica, Michel had written about 5% to be paid to the family. Who is this family? Now, which family is trying to save 'maaa' (uncle) Christian Michel". Earlier the BJP had hinted that Ottavio Quattrocchi, the alleged middleman in the Bofors case and an Italian national, was linked to Sonia Gandhi. Today Mr Patra said "10 Janpath" - Mrs Gandhi's residence --- " wants a detailed report on "who is meeting him (Michel), who has asked what, who he has named, what he is saying, etc,"
Three lawyers, he said, will "advise Christian Michel twice a day, every day for hours together". Besides Aljo Joseph, the list of Michel's lawyers include Vishnu Shankar, whose father is an executive member of the Congress unit in Karnataka, and Sriram Prakash, a former member of the party's student wing. Wanted for investigations in India under the Rs 3,600 crore VVIP chopper deal, Christian Michel was extradited by the United Arab Emirates, where he was living, on Tuesday. The 54-year-old has been accused of accepting a bribe of 30 million Euros (around Rs 225 crore) in the VVIP chopper deal, which involves the purchase of 12 luxury helicopters for use by the President, Prime Minister and other VIPs, by the UPA government led by Manmohan Singh. Earlier this year, Michel's lawyer alleged that he was being pressured by Indian agencies to frame Mrs Gandhi in the case in return for amnesty from criminal proceedings. The Congress said it has asked all its members not to take up the Mitchell's case or brief. The party said it had blacklisted AgustaWestland, but it was the NDA which lifted the blacklist. "Now they are trying to connect the lawyers which will not stand scrutiny," senior Congress leader Jaiveer Shergill told reporters at a press conference. The party also presented a list of BJP leaders who have represented people and firms accused of major wrongdoing. Union minister Arun Jaitley's daughter and son-in-law took retainership for Nirav Modi, the Congress said. Mr Jaitley had represented Dow Chemical, which had taken over Union Carbide Corporation -- involved in the Bhopal gas leak disaster; Ravi Shankar Prasad, who is the Union law minister, has represented Sahara chief Subrata Roy, whose group has been asked to refund money to lakhs of small investors in two outlawed bonds scheme, the Congress said.